I’ve always been known for my smile. Strangers stop to tell me what a nice smile I have, and it’s my secret weapon for disarming people and making friends. However, after years of loving red wine and coffee and just living life, my smile started to yellow and I didn’t like it. Last year I went to my dentist to get professional teeth bleaching. I received the bleach for sensitive teeth and the custom trays and it worked great… but it hurt. My teeth were so sensitive, one session with the trays and it felt as though my teeth were going to fall out. I couldn’t eat anything cold or hot for days after. Life’s short, I didn’t want to spend my days with such an uncomfortable mouth. I stopped using the trays and decided to live with my current color of teeth… that is until Colgate reached out. Colgate encouraged me to try their Optic White regimen. A collection of products to achieve whiter teeth, I was intrigued. I grew up in a Colgate family. 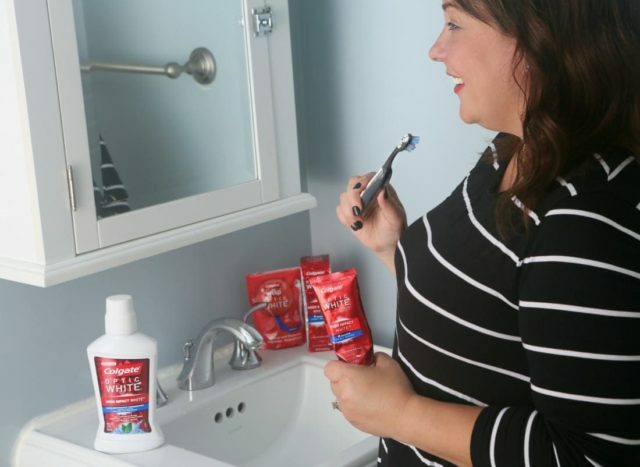 I remember having a toothpaste battle with my husband when we moved in together; he grew up with a different brand but Colgate won. However, I hadn’t tried Colgate’s Optic White regimen because my teeth had become so sensitive from bleaching I was using special sensitive mouth products. 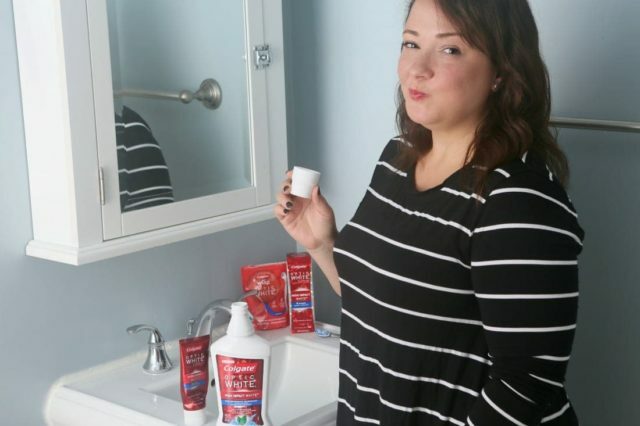 I decided to take the Colgate Optic White regimen for a six-week test drive and report the honest results. At least twice a day, I brush with Colgate Optic White High Impact White Toothpaste. The toothbrush I use is Colgate Optic White Toothbrush + Whitening Pen. After brushing, I use Colgate Optic White WhiteSeal Mouthwash. 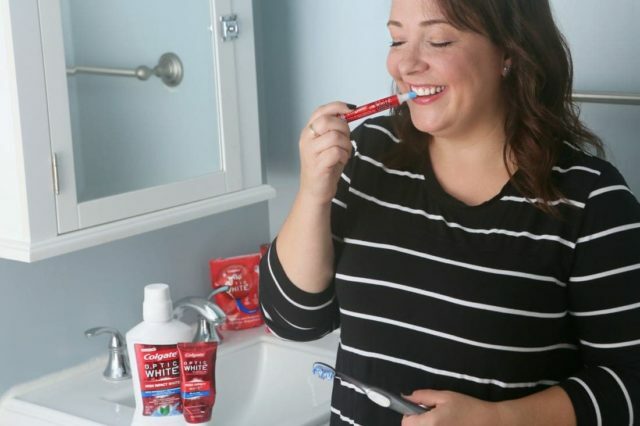 At night after mouthwash, I take the pen that is in the handle of the toothbrush and apply two clicks of the product to my top teeth, and two clicks to the bottom teeth. I also have Colgate Optic White Wisps which I have in my bag and my downstairs half bath for on-the-go refreshing of my teeth. The results are exactly what Colgate promises in their marketing. After six weeks, my teeth are noticeably whiter to people like my husband and my friends. And unlike the bleach trays from my dentist, no discomfort. I don’t miss my sensitive teeth toothpaste, I have no negative reaction to the Colgate Optic White regimen at all. In fact, not only does the regimen whiten, I think it also is more effective at gentle cleaning than what I was using prior. I am kinda sorta completely obsessed with the Toothbrush + Whitening Pen which massages my gums, cleans my teeth, and whitens without scratching, scraping, or irritating. The Platinum High Impact White Toothpaste gently cleans but also leaves me with fresh, clean breath. I’ve used Wisps for years and continue to love them. They’re perfect after going to a restaurant, are my fave after a flight, and do a great job of refreshing the mouth without needing water or a sink. And the WhiteSeal Mouthwash doesn’t burn or sting and its 2% Hydrogen Peroxide helps whiten my teeth while also ensuring my mouth is clean. I didn’t know what the result would be from my six-week trial with Colgate Optic White and am extremely thrilled with how it turned out. In fact, when I was at the store this past weekend I purchased myself another tube of the toothpaste so I don’t run out. I didn’t think it would be possible to get such results from an over the counter product, and I didn’t expect such results without sensitivity! Click here to shop the routine! This toothpaste hasn’t made an extreme difference but has shown results and feels like a deeper clean and a better option than the usual Colgate I would use and wouldn’t go back to the original pastes. I now use Optic as my everyday toothpaste as it does make my teeth whiter and brighter gradually without feeling like I am damaging my enamel. I use other whitening gels in between use. I also experienced awful past n after professional whitening, so it’s good to hear that this alternative has worked for you. Re: wisps and brushing after meals: I’ve heard some dentists say you should always brush after eating. But others say that it’s bad for the enamel to brush after eating, because the enamel is soft from the acid in food. Have you received any guidance on this from your dental team? ?